As of yesterday afternoon, more than 150 votes had been cast. The controversial name change suggestion has been mooted previously by local business and tourism chiefs. Yesterday Willie Cameron, business development director for Cobbs Group, said he is “100% behind” the name change and believes now is the right time for it, particularly in light of a growing far east market in Scotland. He highlighted that most bookings are done through smart phone and tablet devices and tourists will have a much bigger appreciation of the Loch Ness name, with a re-branding working better for search engine optimisation. Mr Cameron said: “I think the team at Inverness Airport is doing a great job by working hard to get more flights in there. They are also going to get the new train station coming in there as part of the future plans. I would say expand the airport and runway. He added that the Inverness name change was just as plausible as Liverpool changing its name to John Lennon Airport, which is iconic for that area. 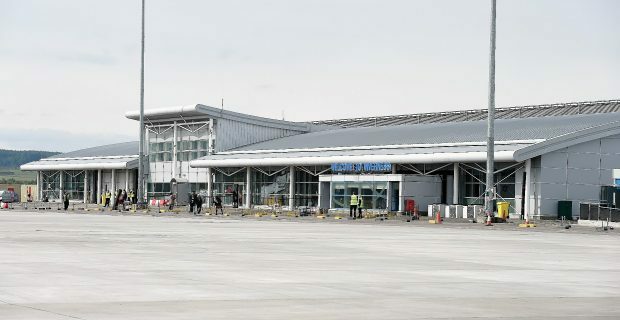 A Highlands and Islands Airport Ltd spokesman said: “The idea of including Loch Ness in the name of Inverness Airport has been raised in the past and we thought it would be interesting to gauge the response from the public. It is understood that the idea would only be taken further through major backing from several tourism agencies, including the likes of VisitScotland. In the UK, the most obvious examples include Liverpool John Lennon Airport and George Best Belfast City Airport. But internationally, there are many more. Chinggis Khaan International Airport, in the Mongolian capital of Ulan Bator, is named after Genghis Khan (the more common translation), the warrior and founder of the great Mongol Empire. Italy’s busiest airport is Rome’s Leonardo da Vunci-Fiumicino, after the great renaissance artist. A controversial renaming of Madeira’s airport as Cristiano Ronaldo International proved controversial in March last year. The Portuguese island is where the footballing superstar was born. The author of the James Bond novels was also honoured when a 2011 re-branding resulted in the Ian Fleming Airport in Jamaican. Protests ensued as many felt the honour should have gone to a Jamaican-born star such as Usain Bolt. In the US, New York’s JFK needs little explanation. Among those on the other side of the Atlantic include O’Hare International Airport in Chicago, named after Edward Henry “Butch” O’Hare, a World War II flying ace for the US Navy who won the Medal of Honour for preventing a Japanese bomber attack on an aircraft carrier.